Calvary Cemetery is where Lionel and Ethel Barrymore are buried. It is also, like all cemeteries, very dangerous to wander at night. Quiet, subdued, well-kept, Calvary Cemetery is watched over by angels, disciples, and other celestial figures — or so the heavily Roman Catholic masonry and theme would have one believe. This graveyard is home to many beautifully crafted stone figures who keep eternal watch over those interred here. Among the most famous dead here are Lionel and Ethel Barrymore, and Lou Costello of Abbott&Costello. 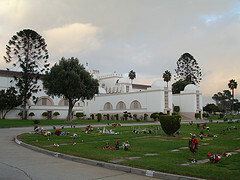 Also within this cemetery is Calvary Mortuary, which serves Catholic cemeteries and families throughout the city. Additionally, there is a mausoleum with breathtaking stained glass windows of a religious flavor. Calvary Cemetery is the resting place of Lionel and Ethel Barrymore and Lou Costello of Abbott&Costello fame. There are also a host of other notable figures buried here. A list of notable logs that have occurred within this establishment.